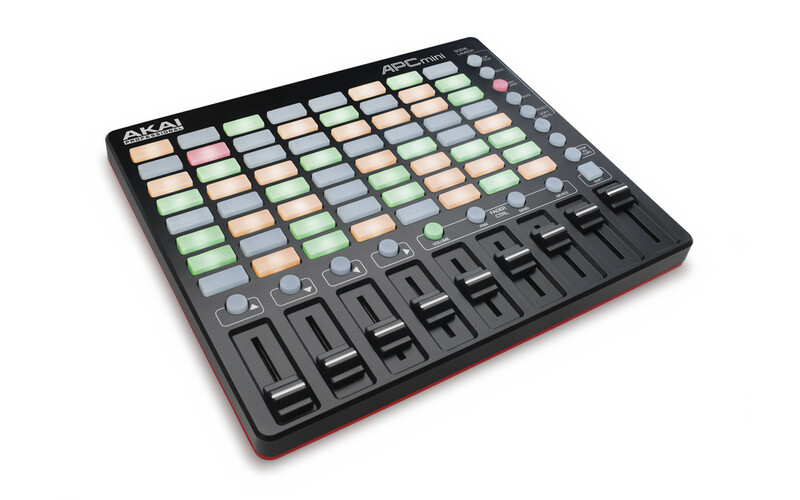 Akai Professional has announced the APC40 mkII, APC Key 25, and APC mini, three new Ableton Live controllers. Akai Pro’s flagship Ableton Live controller, the new APC40 mkII, incorporates five years of user feedback into its design for extended functionality, countless musical capabilities, and improved workflow. 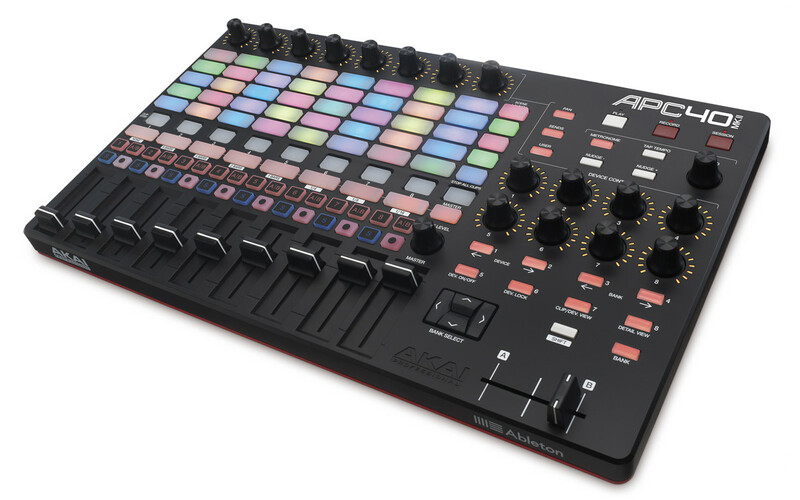 The APC40 mkII features a 5×8 RGB LED clip-launching matrix, assignable A/B crossfader, 8 rotary knobs, 8 channel faders, and a send button for quick access to send busses. Included with the APC40 mkII is a suite of software, samples, and loops for out-of-thebox electronic music production: Toolroom artist launch packs, Prime Loops sample packs, Hybrid 3 by AIR Music Technology, and SONiVOX Twist give users endless music production possibilities with hand-selected samples & loops and high-definition virtual synthesizers. The APC40 mkII is USB-powered and supports plug-and-play. 5×8 RGB LED clip matrix—launches clips with visual feedback. APC Key 25 is the first controller designed for Ableton Live that is equipped with a highperformance keyboard. Uniting the power of a clip-launching panel with a keyboard interface, the APC Key 25 couples real-time control of Ableton Live with traditional composition tools. 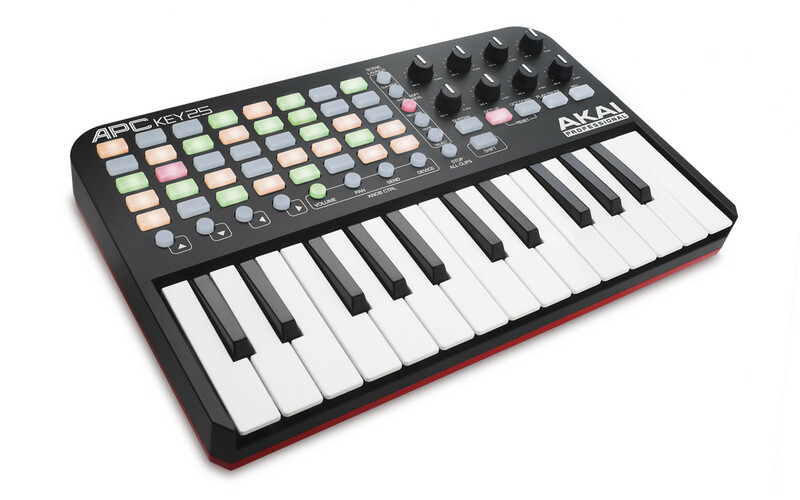 The controller includes 25 synth-action mini keys, a 5×8 clip-launch matrix with tri-color visual feedback, 8 control knobs, USB power, and plug-and-play connectivity. The APC Key 25 comes mapped to Ableton, but can also be used as an all-purpose MIDI controller. Ableton Live controller with keyboard—25 synth-action mini keys. Tri-color clip matrix—launches clips and multicolor lighting displays clip status. 8 assignable control knobs—hands-on-control of any Ableton Live parameter. Octave Up, Octave Down, and Sustain—expands keyboard range and expression. Music production content—Toolroom artist launch packs, Hybrid 3 by AIR Music Tech & SONiVOX Twist. APC mini is the most portable all-in-one Ableton controller solution with Akai Pro build quality. Engineered for the mobile musician or producer, APC mini concentrates the essential features of the APC40 mkII into a space-saving design. An expanded 8×8 multicolor clip-launching grid, 8 channel faders, and a compact chassis provide unprecedented hands-on control over Ableton Live with a small footprint. The APC mini is also USB-powered and supports plug-and-play. Tri-color clip matrix—8×8 grid launches clips and multicolor lighting displays clip status. 8 channel faders & 1 master fader—provide hands-on-control of Ableton. Compact construction—portable design for mobile performers and producers. Music production content—Toolroom artist launch packs & Hybrid 3 by AIR Music Tech. The APC40 mkII, APC Key 25, and APC mini will be available in Summer 2014, distributed worldwide with the following street prices: APC40 mkII ($399.99 USD), APC Key 25 ($129.99 USD), and APC mini ($99.99 USD). 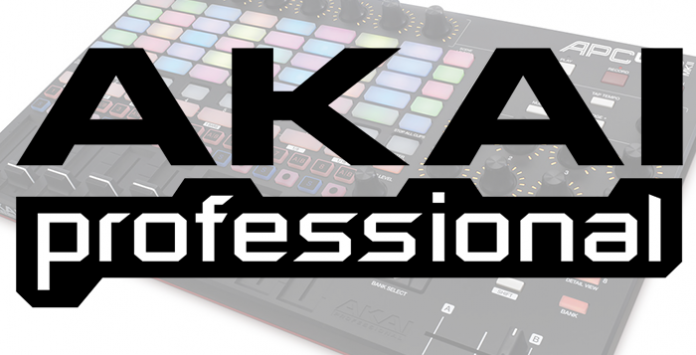 Akai Professional are set to unveil the APC40 mkII, APC Key 25, and APC Mini at Musikmesse, Hall 5.1, Booth B45, March 12-15 in Frankfurt, Germany.